The Italian sausages that i buy at Lina Stores in Soho always make me glad I've cooked them so they are never far from my mind, especially as I buy them in bulk so there is usually a stash in the freezer ready for raiding when the mood takes me. My supply of lentils is similarly abundant. This dish is fantastic if it’s a dull grey day and you need a little healthy TLC from your food to counter the rich indulgence of a glass of cabernet sauvignon. heat the olive oil and fry the sausage pieces and fennel until they are cooked through (i like to use quite high heat so the edges of the sausage catch a little). remove the sausage from the pan and add the onion (plus a bit more olive oil if you need it) and cook over a high heat until the onion is soft and the edges char a little. add the garlic and cook for another 30 seconds. add the stock and simmer gently until the lentils are cooked (you may need to add extra stock or boil off any excess depending how long they take to cook, which will depend on how fresh they are, but should take 15-20 minutes). add the cooked sausage, spinach and basil. 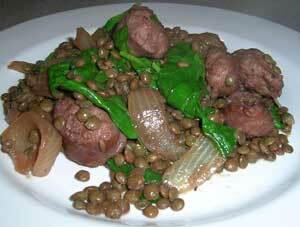 mix well and warm over a low heat, with the lid on the pan, so the spinach wilts and the sausage heats through.